The bald middle aged man gazing at his watch while sitting the wrong way in an armchair just happens to be one of the most powerful names in the watch universe. Now he’s launched a blog to speak to customers more directly. The name of the blog is Hublot Nation. 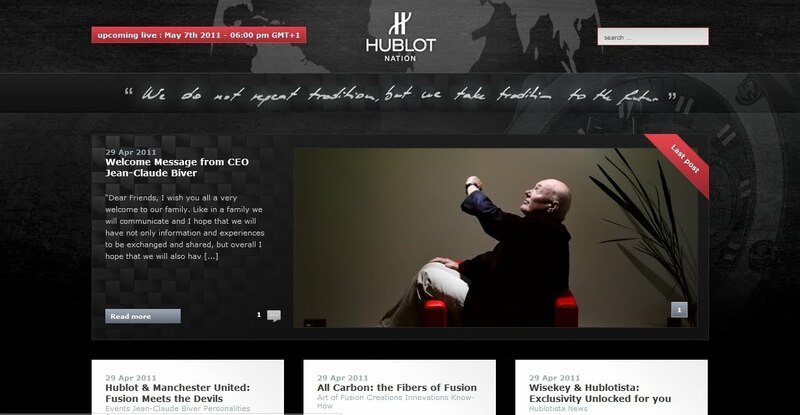 The name of the man in the picture is Hublot CEO Jean Claude Biver. Hublot Nation promises to put new posts on its blog nearly every day, just like a regular blogger. in this way it will share its latest news, its latest creations, offer in-depth reports, live coverage of the brand’s major events, unusual stories, all the things a good blog should do. If you subscribe to Hublot Nation you will also be able to discuss all the topics posted on the blog as well as make comments on events as they unfold live. You can access the new blog through Facebook or Twitter. Or access the site directly using your real name, or with the anonymous nickname of your choice. Above all what Hublot Nation offers is easy accessibility to the key decision maker at Hublot. Switched on brands recognise that they have to have a two way dialogue with their customers and this is another way in which Hublot will help to achieve that. The url is www.hublotnation.com. You can start a dialogue today.